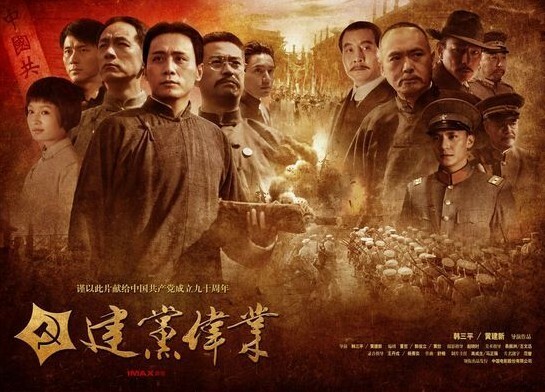 BEIJING, June 17 (Xinhuanet) -- "Founding of a Party", the film most likely to become a blockbuster celebrating the 90th anniversary of the Communist Party of China, was released in China on Wednesday. It's part of a series of events in China marking the anniversary that will be celebrated nationally on July 1st. The movie "Founding of a Party" traces developments between the 1911 revolution that overthrew imperial rule and the establishment of the Chinese Communist Party on July 1st, 1921. It focuses on the struggles of a group of committed young idealists that work together to fight corruption and abuse of power that was rampant in a China reeling from revolution and upheaval. In 1921 the small group of intellectuals officially formed the Communist Party of China. This film features many of the Chinese film industry's biggest names such as Chow Yun-fat, Liu Ye, Fan Bingbing, and John Woo who is better known as a director of action movies. The audience that attended the premiere were impressed. Kong Feng, internet engineer, said, "I think it's quite shocking and educational." He Ping, saleswoman for insurance company, said, "I liked the story and the historical elements of the movie. The performance of the actors is just part of the attraction. What attracted me the most was the story itself." China Film Group is hoping for a repeat of the success it had with "The Founding of a Republic," which made 415 million yuan, or 61 million U.S. dollars, at the box office.